A Pompano Beach commissioner wants the city to take more action against anyone responsible for a noose found dangling in June over a black firefighter’s seat. City Commissioner Michael Sobel’s push for additional measures comes days after a firefighter recruit was fired during an inquiry into the reported noose. Sobel on Monday asked city administrators to forward the case to deputies and prosecutors for further review. A Broward Sheriff’s Office spokeswoman said the office would not comment on whether something rises to the level of a crime unless it is being investigated as such. Three other firefighter recruits resigned before the investigation concluded Aug. 9, Pompano fire officials said. The noose is a symbol of racial hatred that represents the lynchings of blacks, particularly by mobs in the South after the Civil War. The fired recruit, Matthew Reilly, referred questions to his lawyer, who could not be reached for comment Wednesday. Those who resigned during the investigation were Kerop Berberian, Geandy Perez and Austin Sovay, the city said. Sovay told the Sun Sentinel last week the rope was not tied in a noose — it was a fishing knot. Berberian said the recruits were let go for the wrong reasons, but didn’t elaborate. And Perez, whom a city fire chief said was the knot-maker, couldn’t be reached for comment. Sobel also is calling for a full accounting of the city’s costs to train the departed recruits and whether the city can recoup those costs through a lawsuit. Sobel said he spoke with city staff this week but hasn’t received a formal response from City Manager Greg Harrison about his requests. City officials couldn’t be reached for comment to discuss Sobel’s requests. Mayor Lamar Fisher on Thursday said he’s confident the matter was fully investigated and all the appropriate action has been taken. 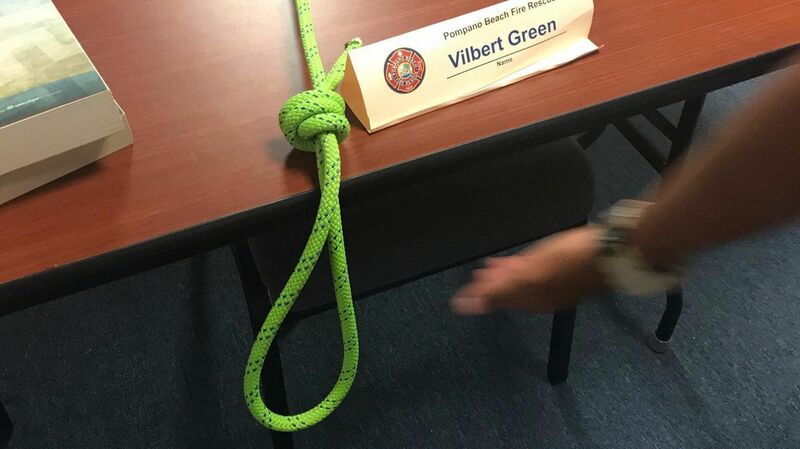 The city says the noose was found June 7 at Pompano Beach Fire Training Center, hanging over a desk and chair and next to the nametag of Vilbert Green, the only black firefighter recruit in a class of six. Green took a picture of what he found after returning from an activity outside the classroom, but opted not to report it, said Pompano Beach Fire Chief John Jurgle. Green told another firefighter, and news of the noose made its way to Jurgle on July 27. That day, the chief kicked off an internal investigation. The noose incident may not rise to the level of a hate crime under Florida law, said attorney Kenneth Padowitz, a former Broward County prosecutor. “A lone incident of leaving something like this on a desk would not violate the hate-crime statute, but it could potentially violate federal law,” Padowitz said. If the victim were to have been singled out due to his race, and the noose was part of ongoing harassment, then it could lead to a hate-crime classification under Florida law, Padowitz said. Sobel on Wednesday said he thinks more than what the city already has done is needed. He wants to know how often similar incidents have occurred — and whether there may be wider issues regarding the culture at the city fire department. He said he’ll be asking for how much diversity is represented in the firefighter force.